LESS than two years ago, at the G8 summit in L’Aquila in Italy, prime ministers and presidents sat down to talk about world trade and food security with Muammar Qaddafi. Today Libya’s tyrant is paying mercenaries to shoot his people in the streets like “rats” and “cockroaches”. Gangs of soldiers have roamed Tripoli, the capital, in open-backed trucks searching for people to machinegun. Snipers have fired indiscriminately from the rooftops and, it is said, helicopter gunships have spread terror from the sky (see article). The hope is that by the time you read this Mr Qaddafi has fallen, and Tripoli is sharing the joy of Benghazi to the east, where Libya’s uprising began. Yet his people are paying a terrible price for freedom. And the fear is that even now Mr Qaddafi will somehow clamber over the bodies littering the streets to seize back the power that has slipped away from him. As the Arab awakening has spread, each leader has sought to save his skin by being crueller than the last. In Tunisia Zine el-Abidine Ben Ali met peaceful crowds with concessions. In Egypt Hosni Mubarak tried to ride out the protests by mixing concessions with force. In Bahrain King Hamad bin Isa al-Khalifa resorted to violence, but did not have the stomach for the fight. 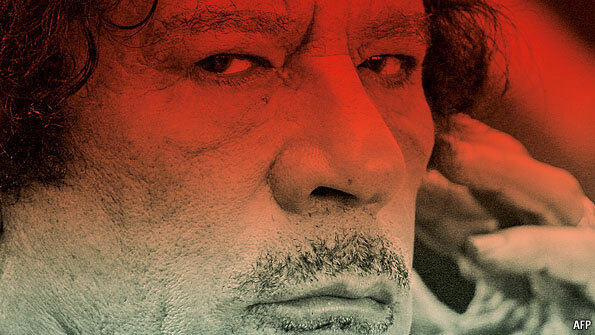 In Libya Mr Qaddafi seems to crave blood. Screaming ghastly defiance in an hour-long tirade on February 22nd, he vowed to “cleanse Libya house by house”. If he prevails, dictators the world over will know which course to follow. Mr Qaddafi is no stranger to brutality and persecution—that is how he has kept power for 41 years. He has oppressed his own people, sponsored terrorism and spread conflict in Africa. Why then did world leaders embrace him in L’Aquila? Why indeed have they dealt with autocrats and kings across the Middle East only to see the people rise up? Just now, when the air in Libya is thick with gunfire, it is tempting to think that indignation alone could furnish a strategy for dealing with dictators. Rather than appease them and make grubby deals for the sake of oil and geopolitics, the argument goes, the only ethical foreign policy is to reject them and walk away. Sometimes that is true—it was what the West tried with Mr Qaddafi a quarter of a century ago, after his diplomats shot a British policewoman, his agents bombed a nightclub in Berlin, and his secret service started to bring down airliners. Yet it seldom makes sense to isolate large parts of the world permanently, no matter how unpleasant the tyrants who govern them. America and the Soviet Union negotiated and traded with each other even at the height of the cold war. The outside world has talked to the murderous regime in North Korea about its nuclear weapons. Economies need oil and it is idle to suppose otherwise. The question raised by the wave of protests spreading across the Middle East is not whether to deal with autocrats, but how to deal with them. When strongmen are vulnerable, as now, the priority is to push them towards reform and away from violence. 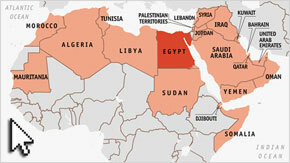 Barack Obama, America’s president, was right to stand behind the protesters in Tunisia, Egypt, Bahrain and now Libya. America’s army chiefs were right to use their influence to restrain Egypt’s armed forces from shooting into the crowds (see article). And if Mr Qaddafi uses his air force to kill large numbers of his own people, the world would be right to enforce a no-fly zone over Libya. And yet Mr Qaddafi also made concessions that were worth something to the West, to the region and to Libyans themselves. The greatest of these was to give up his nuclear programme and help to blow the lid on the nuclear black market centred on Pakistan. Libya also stopped sponsoring terrorism in the West, though it continued to sow mayhem in Africa. And, hard as it is to remember just now, Libya’s people were less oppressed after their country rejoined the world. Just occasionally, the power of ordinary people can overturn the certainties of the experts. That is why countries dealing with dictators should never confuse engagement with endorsement and why the West should press for human rights and democracy—even when it is inconvenient, as it is with China and Russia. Just ask those who have summoned up the courage to risk death for a cause on the streets of Tripoli.